JACKSON HEIGHTS — Residents of a 79th Street apartment building are frothing over a local Starbucks dumping its trash all over a neighborhood street. 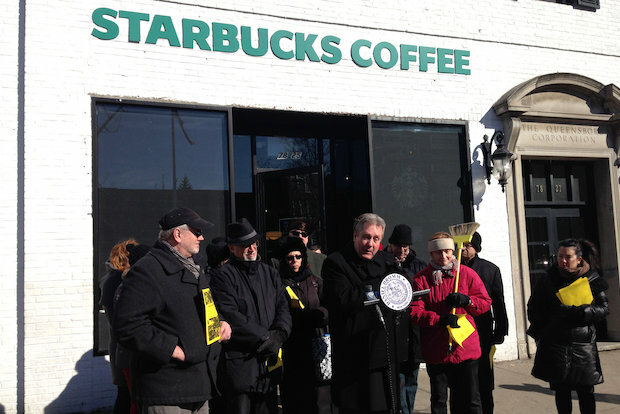 Angry neighbors and a local politician rallied in front of the java joint at 37th Avenue and 79th Street Friday morning, calling the national coffee chain a "bad neighbor" for dumping on the community. Councilman Danny Dromm said the store, which opened in 2008, leaves its garbage on 79th Street, without properly tying or securing it. Open bags of coffee grinds, food and other trash is often strewn around, residents said, and is usually left out for 12 hours or more. "Enough is enough," Dromm said. "We have had it." He said he attempted to speak with the store's manager, the company's regional manager and the corporate office, but was denied each time. Resident Elisa Carlucci said Starbucks had been littering on 79th Street "for several years" and said she and her neighbors were "exhausted" from countless calls to the store's manager, the company, 311 and other city agencies — to no avail. "We have reached out to all parties involved and have been completely ignored," she said. Susan Latham, who also lives on 79th Street, said the garbage location is just feet away from her building's basement, and she fears an influx of vermin if it continues. "Food waste is especially concerning," she said. She and others think Starbucks should arrange for trash pickup on commercial 37th Avenue to avoid problems with the buildings next door. The city's map of 311 complaints shows the city investigated improper commercial waste at the intersection, but didn't find any violations. A spokeswoman for the Department of Sanitation said the Starbucks received a $100 summons on Jan. 3, 2013 for a dirty sidewalk, which was paid in full. On Feb. 5, 2014 she said they received a summons for not having a private carter sign, which is a $100 fine. That hadn't been paid yet, she said. A spokeswoman for Starbucks, Laurel Harper, said "being a good neighbor is really important" to Starbucks. "We have stringent cleanliness standards in place for inside and outside our stores," she said. "We're looking into this immediately and making sure that our standards are being followed."